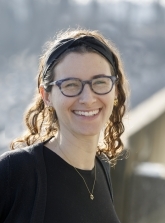 Rebecca Weintraub is the Alumni Coordinator at Hadar. After two transformative years as an education fellow in the Hadar beit midrash and teaching in the Solomon Schechter High school of Westchester, she is excited to start working with the outstanding alumni community of Yeshivat Hadar. Rebecca grew up in Westchester, New York. She attended the Solomon Schechter High School of Westchester, spent a gap year traveling the world with Kivunim, New Directions. She graduated with a degree in Jewish Studies from the University of Maryland, College Park.